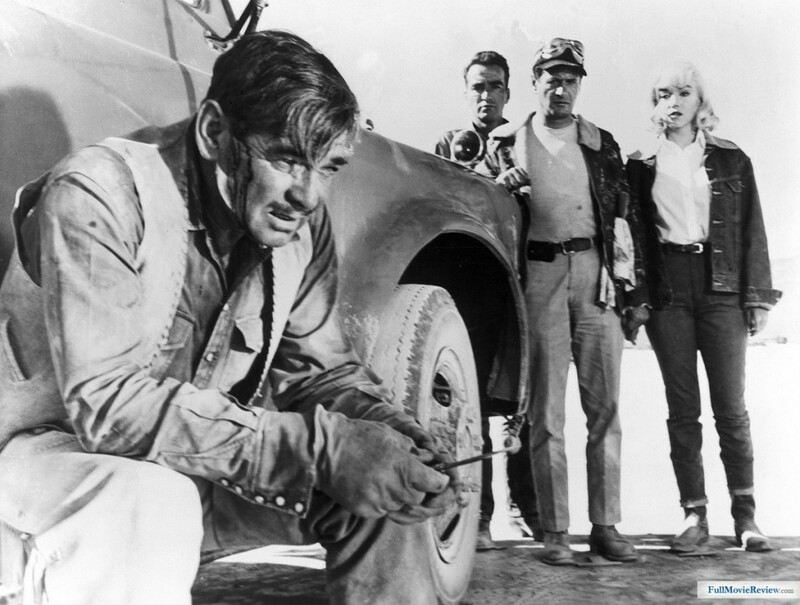 THE MISFITS , immediately ‘legendary’ upon release in 1961, cussed and applauded, blamed and excused ,cherished and lamented, remains almost as elusive today as the doomed wild mustangs that test its protagonists. For movie history buffs and star-watchers it’s a must. For the average paying customer of the time it was a mordant, enigmatic curiosity. For those modern viewers not aware of, impressed with or otherwise awestruck by its creative team it’s a harder sell. 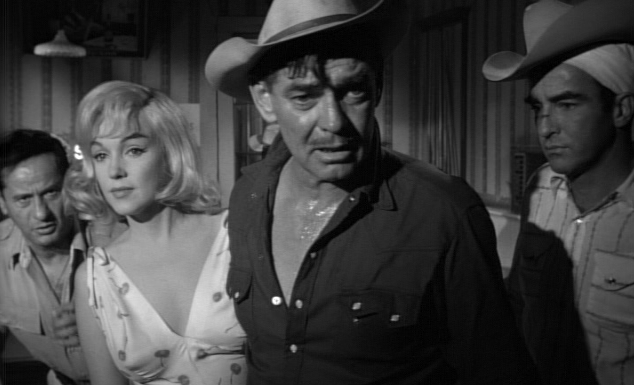 Three iconic stars—Clark Gable, Marilyn Monroe, Montgomery Clift: all doomed. A mercurial maverick director (John Huston) who veered from aced-across hit to muddied flop like a metronome, back in the States after a decade filming abroad. A fabled intellectual wunderkind writer (Arthur Miller) with scores to settle, truth to get at, a neurotic wife to deal with—and no clear way to do it all. Two great co-stars, Eli Wallach and Thelma Ritter. A disintegrating marriage, an interfering guru, drug and alcohol abuse wracking the shooting schedule. Gambling. Heart attack. Oh, and..a story. Miller’s script reaches for something profound to say about the ethos price tag of frontier macho booze-soaked backslapping. The ironic backwash of emasculating psyches in the man-children inheritors of the Old West’s rugged individualism as it butts heads with the New West (the Nevada of quickie divorce and quicker casinos) where mustang horses roped for dog food replace busting broncs. Lost people too proud to surrender. Or… something like that. Not big on the hope meter. Millers heavy-going dialog mouthfuls ensure everyone gets a few speeches. Maybe he and James Edward Grant got drunk together and made a bet on who could out-babble the other? Some of the talk hits home, some doesn’t make it past second. 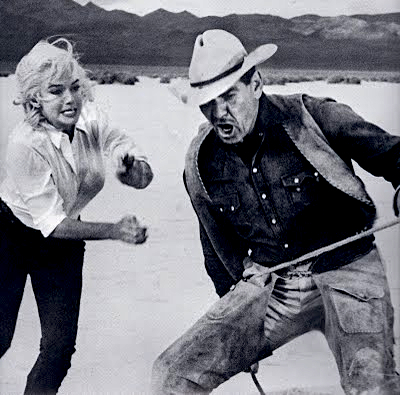 Director John Huston took off for the gambling tables mid-way, Marilyn’s state of mind and disruptive behavior just too much to handle. 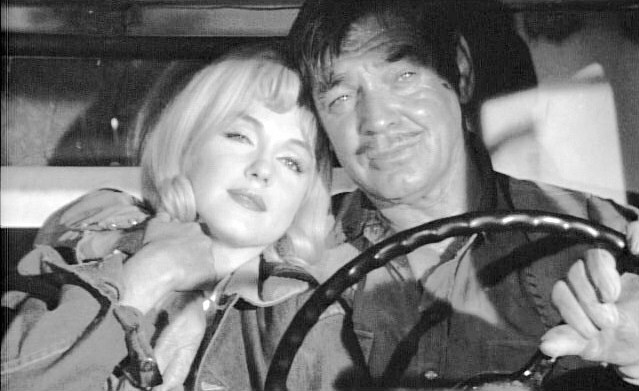 Clift was in likewise lousy fettle emotionally, tacking due south on his course to self-annihilation, although even his tiresome eccentricities couldn’t match Monroe’s maladies. ‘King’ Gable was professional, exhausted and seething. Wallach and Ritter just dug in, held on, delivered. The back story to the tortuous making of the movie has produced volumes and it can’t help but cloud the experience. To some, particularly MM and/or Monty apostles it’s a classic, and they both do some terrific work. She really opens up, bracing, when you factor in that her condition often left her going literally one sentence at a time before dissolving. Clift, so frail he could barely light a Lucky, manages to convince as a cowboy, with just a few moments where his voice cracks into that jittery Katherine Hepburn tone. “The movie that killed Gable” has him giving what he thought was his finest performance, and he infuses his classic swagger with real pathos—again, a blend of fortune with talent, as he felt adrift in an opaque script he couldn’t make heads or tails of. It’s a broken mosaic, made of some pieces that shimmer brilliantly, others that reflect nothing, with empty slots between that are left for you to fill in. 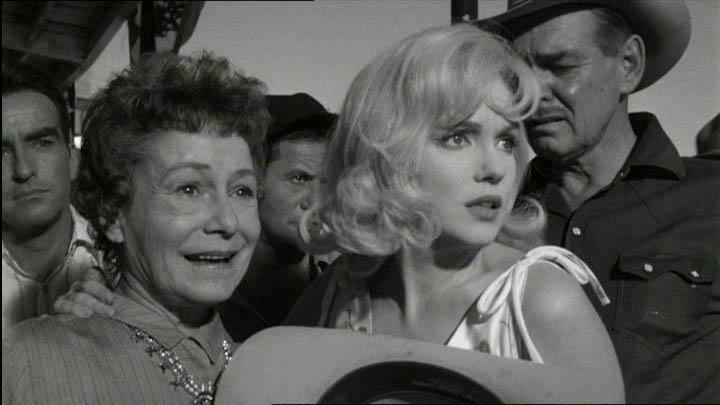 Russell Metty did the fine black & white lensing, Alex North the spare score. Estelle Winwood has a what-for? walk through (was she a friend of Huston’s? ), Kevin McCarthy a blink-and-miss cameo. It came in 18th for the year, earning $11,400,000. Trot out the M’s—Muddled. Murky. Mysterious. Malicious. Maimed. Maladroit. Magnificent. Maddening, because it’s all of those.